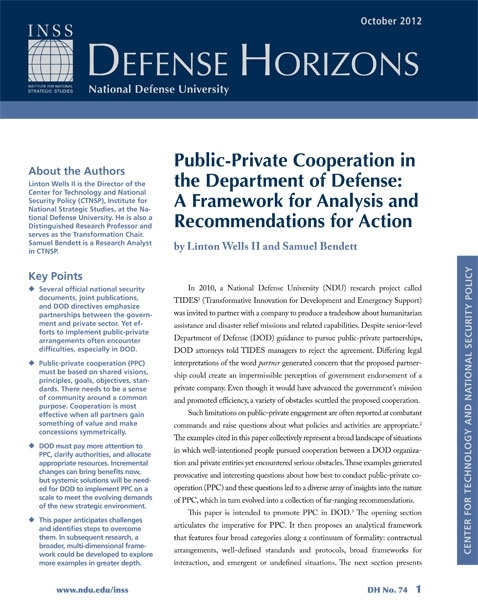 • Several official national security documents, joint publications, and Department of Defense (DOD) directives emphasize partnerships between the government and private sector. Yet efforts to implement public-private arrangements often encounter difficulties, especially in DOD. • Public-private cooperation (PPC) must be based on shared visions, principles, goals, objectives, standards. There needs to be a sense of community around a common purpose. Cooperation is most effective when all partners gain something of value and make concessions symmetrically. • DOD must pay more attention to PPC, clarify authorities, and allocate appropriate resources. Incremental changes can bring benefits now, but systemic solutions will be needed for DOD to implement PPC on a scale to meet the evolving demands of the new strategic environment. • This paper anticipates challenges and identifies steps to overcome them. In subsequent research, a broader, multi-dimensional framework could be developed to explore more examples in greater depth.